I’ve been rubbish at blogging this year! For the first week of 2015 me and the hubby had the flu, and then we spent last week rushing to get the living room decorated before our new carpet arrives. I’ve just not had the time, energy or inclination to get creative in the kitchen! 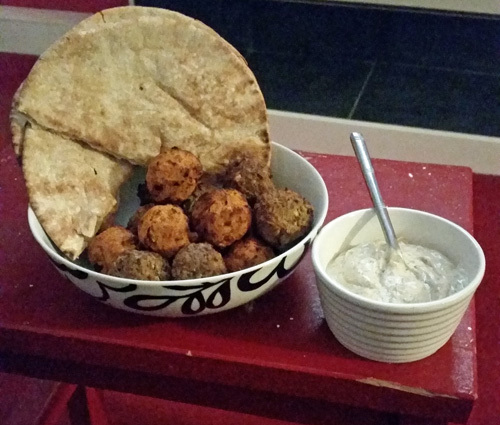 I’m afraid today’s entry is still a bit of a cop out… but it was tasty so I thought it was worth typing up. We had pitas with falafel tonight and I wanted a nice sauce to go with it. We had an ancient bottle of raitia in the back of the cupboard, which would have worked, but firstly its completely out of date and secondly it’s from my veggie days and no longer fits into my lifestyle. So in the bin it went! So what to have instead? 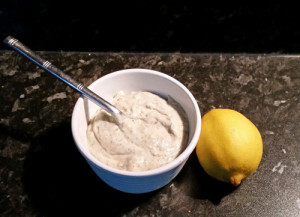 My lemon and mint, dreamy creamy tahini dressing – it does exactly what it says on the tin! Chop the tofu into medium-sized chunks. Get a small pan of water boiling and gently add the tofu. Boil for 1 minute before draining and leaving to cool. (This is a tip I picked up from Isa Chandra Moskowitz’s awesome book “Appetite for Reduction” – she cooks the tofu first for her “Sanctuary Dressing” to get rid of the beany flavour). Put the tofu into a blender (smaller is better if you have the option since we’re making a relatively small volume). Add the lemon juice, tahini, mint, cumin, garlic powder and salt. Whizz up until smooth (a minute or so). Scrape down the sides of the blender with a spatula and add the soya milk (or any other replacement milk). Whizz again until blended. I like my dressing quite thick but if you wanted to thin it down with more plant milk then I’m not going to stop you! I always think this type of dressing is best served cold, so into the fridge for 20 minutes or so it goes, ready to serve up with some tasty falafel. I got mine from Costco of all places and it was very nice too! Is it too late to mention New Year resolutions? I’m planning on learning to play the drums ;o) Wish me luck!